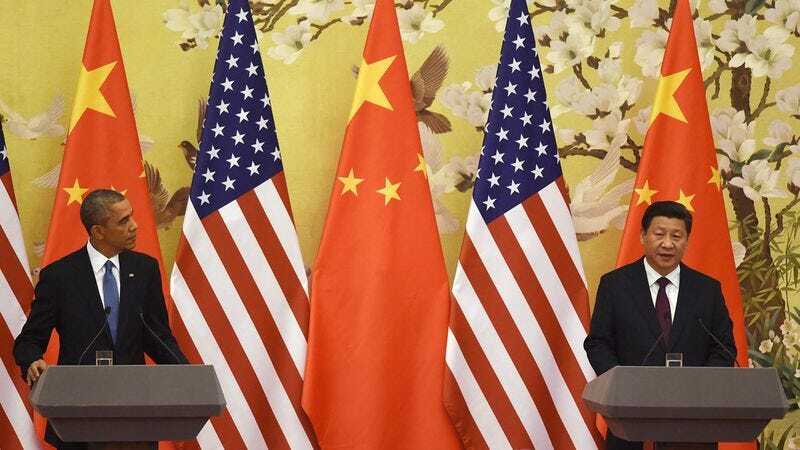 BEIJING—Acknowledging the industrialized nation’s role in global climate change, China reportedly reached a landmark agreement with the United States Wednesday, pledging to significantly increase the rate at which it falsifies air pollution data over the next 15 years. “As the world’s leading manufacturer and a rising global economy, we consider it our responsibility to begin taking aggressive measures to fabricate pollution statistics and openly misinform the rest of the world about our level of carbon emissions,” said Chinese president Xi Jinping during a joint press conference with U.S. president Barack Obama, noting that, while China has already taken steps to misrepresent its air quality, it will steadily expand its current deception and begin distorting data in a variety of new sectors, such as grossly overstating its level of investment in solar, wind, and other renewable energy sources. “China is strongly committed to the goal of claiming its greenhouse gas output has been cut in half by 2030. We will work tirelessly to exaggerate, manipulate, and in many cases flat-out lie about the amount of pollutants Chinese factories and energy plants release into the atmosphere. That is our unwavering pledge.” At press time, Chinese officials announced that the country had already met its goal.